Pivot Point ductile S-Hooks are an easy-to-use, versatile fastener. Made from low-carbon steel wire, zinc plated. For an improved S-Hook, check out our exclusive Infinity S-Hook. 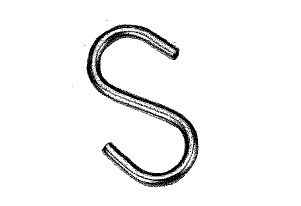 This S-Hook style quick connector does not require open, closing, bending or pinching of ends, as with traditional S-Hooks.